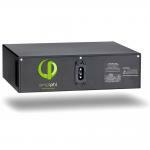 Inverters with an M- suffix are RV or Marine versions. They have a transfer switch that switches hot and neutral. 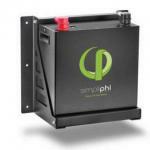 The FX series is designed to survive in environments that would normally destroy other inverter/chargers. Protection for internal components is provided by our die-cast aluminum chassis with a powder coated finish to prevent corrosion. Internal and external cooling fins allow for passive heat transfer, enabling peak operating efficiencies as high as 93% and looking cool while doing it. Water and small particles are kept out through the generous use of gaskets and 0-ring seals on all seams and openings. A protective conformal coating on all circuit boards provides the final line of defense against corrosion. The now standard externally mounted “TURBO” cooling system improves performance in hot conditions. Sealed design protects internal electronics from salt, dirt or contaminated air, bugs, critters, mold, etc.